RV kits include all the parts needed to build a complete airframe. The builder must provide the engine, instruments, propeller, avionics and upholstery. All of our kits have been reviewed by the FAA and have been found eligible for licensing in the Experimental Amateur Built category. This means the fabrication and assembly work we do for you on the quickbuild kit is less than 50% of the total work required to complete the aircraft, and that at least 51% of the work remains for the kit builder. All RVs, whether built from a Standard or a QuickBuild Kit, are constructed from the same parts. The difference is the degree to which these parts have been pre-assembled when the builder receives them. If the builder has a little more money to spend, and wants to get flying even sooner, the QuickBuild Kit is an excellent value. The Standard Kit is perfect for the builder who enjoys the process and is working on a limited budget. Please visit the Standard Kits page for more information on those kits. So, the RV is exactly what you’ve been looking for, ever since you started drawing airplanes on your third-grade workbook cover. But now you have a family of your own, and a job with real adult responsibility. There are soccer games to attend, household duties and vacations… Time is precious. 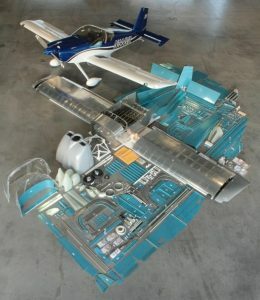 Spending 1800-2000 hours in the shop constructing an airplane is simply going to be difficult. How would you like to hire a team of experienced experts, with well over a thousand completed RV airframes on their resume, for twenty-five weeks, eight hours a day? This team will build the first half of your kit, handling the jigging and riveting about 75% of your metal airframe. They will do all the messy jobs, like sealing the fuel tanks and priming to protect against corrosion. They never leave a mess in the shop, make no noise to disturb you spouse, don’t need insurance and never want to use your bathroom. When they leave, you’ll have only 800-1200 hours of work to finish your airplane. And, they work for about eight dollars an hour! We don’t know anybody like that either, but we can tell you how to get the result: Order a QuickBuild Kit. 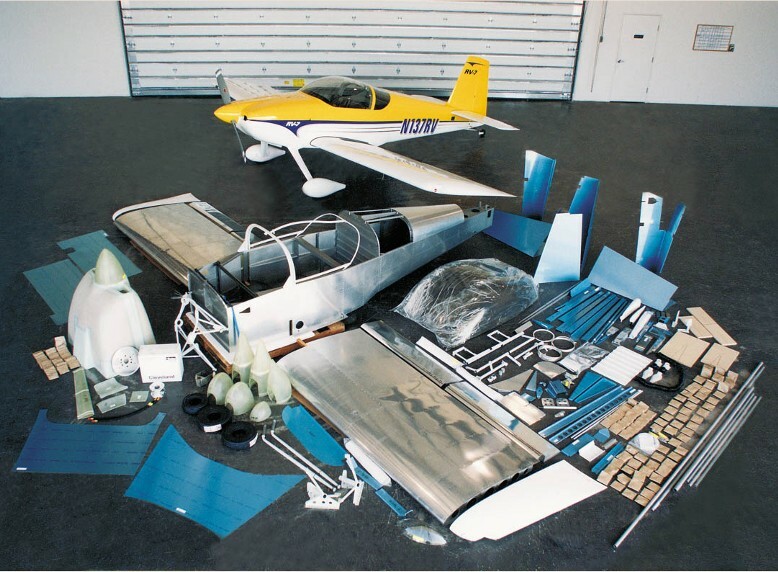 Van’s QuickBuild Kits will cut building time for the RV-7/7A, RV-8/8A, RV-9/9A, RV-10 and RV-14/14A by 35-40%. The complete QuickBuild Kit consists of a Standard Empennage/Tail and Finish kit, but the big difference is that the Wings and Fuselage will arrive largely complete! You can pry open the crate, set the QB fuselage on the floor, toss in a cushion off the couch (just don’t get caught! ), climb in and be making airplane noises on the very first day. Talk about motivation! Even though QuickBuild Kits look very much like complete airframes when they come out of the box, the FAA has recognized them as meeting the “51% rule.” Almost 2000 QuickBuilds have been delivered to customers, and over a thousand have been completed and flown in several different countries, including Canada, Australia and the UK. Let’s look at a QB kit in more detail. All RVs are created from the same parts, and practically all of those parts are manufactured at Van’s factory in Aurora. QuickBuild Kits are assembled at Van’s partner company in the Philippines from parts supplied by Van’s. These skilled craftsmen have been assembling Van’s QB Kits for more than twenty years, and it shows in the quality of the assemblies delivered to Oregon. Each kit is inspected before it leaves the overseas facility. Several kits at a time are placed in specially designed shipping cradles, loaded into a large secure container, and put on a ship to make the trip back to Van’s headquarters in Oregon. When a container of QB kits arrives, each is carefully unloaded and inspected yet again. The wings are crated and the fuselage placed on pallets and stored in a large rack. When it’s time to fill your order, the fuselage is taken down, filled with the other parts and materials needed to complete the kit, and then placed in a large crate. When the shipping company’s truck arrives, both crates are gently loaded, and within a few days a small crew of excited RV builders is prying the crates apart… carefully! Opening the smaller crate reveals a set of wings, completely riveted except for one outboard main skin. The fuel tanks are complete and already pressure tested, the leading edge is attached and three of the four main skins are completely flush riveted. As the builder you will drill and rivet the one remaining skin, install the control pushrods and blind rivet the composite wingtips to the outboard end. The ailerons and flaps are assembled and attach to the wing with a few bolts and a hingepin. We estimate that a builder working two hours an evening and a long Saturday can complete a QB wing to flight status in a week. In the larger crate is the fuselage, and it’s even more impressive than the wings. The basic structure is complete, resulting in something that resembles a rigid, streamlined aluminum canoe. All the mounting points for the wings, tail and landing gear are finished, the tailcone skins are installed, and the firewall is complete. Exact details differ between each aircraft model, but in general the builder finishes the inside of the cabin and baggage compartment(s) and installs the skins just forward and aft of the canopy. On the side-by-side airplanes, the QuickBuild Kit can be finished as either a tri-gear or a tailwheel airplane, with either the tip-up or the sliding canopy. On the RV-8/8A, your landing gear configuration decision needs to be made before the kit is ordered. After the wings are finished and your fuselage is nearing completion, it is time to order the Finish Kit – which is exactly the same for either the Standard or QuickBuild kits. The QB kits come in BIG crates (refer to the Crate Sizes and Weights document – PDF) so be prepared with plenty of help when the truck arrives. You’ll need the same space as with a Standard Kit, but you’ll just need more space sooner. Best to get the garage completely cleaned out before your kit arrives! Can I have the QB shipped directly to me from the Philippines and save on shipping charges? No. International shipping and bonding regulations require that the assembled QB kits be delivered to Van’s before delivery to the customer. It may seem silly if the kit is eventually destined for Australia, for example, but trying to step outside these regulation results in great complication and a huge increase in costs. Returning all the kits to Van’s also allows Van’s to inspect each and every kit for shipping damage and assembly quality. What tools do I need for a QB? The same tools are used on both the Standard and QuickBuild kits…they just aren’t used as many times on the QB. Will I need to build jigs for a QB? No jigs are necessary for the QB wings and fuselage, but a couple of simple fixtures may be needed when you to build your empennage. Most of these are included in the empennage kit. Can I use the empennage I started years ago and still do wings ad fuselage as a QB? Sure, but remember that empennages are specific to the aircraft …you can’t install an RV-6 empennage on an RV-7 or RV-8, for instance. Can I order the QB wings and fuselage separately? Yes. By definition, the QuickBuild kit includes a QB wing and fuselage. They are manufactured, ordered and shipped as a set. However, it is also possible to order either a QuickBuild wing or QuickBuild fuselage kit and build the other portion from a Standard kit. This is considered an option on the Standard Kit. Can I build my own wings and order a QB fuselage only? Yes. If you already have a wing kit, you can just return the fuselage center section that came with the wing kit to Van’s with your QB Fuselage order. Center sections are interchangeable, but we’ll need yours back to keep numbers even. If you are intending to order a Fuselage QB when you order your Wing Kit, be sure to tell us when you place your order so that we can keep the center section and send it along to the QB factory. For reference, please refer to the Weight and Dimensions document (PDF), which describes the sizes and weight of each standard Van’s crate used to ship kits. Note that changes and substitutions to kits will affect the dimensions and weights, and as such the numbers in the supplied documents are to be used only as sample/reference.